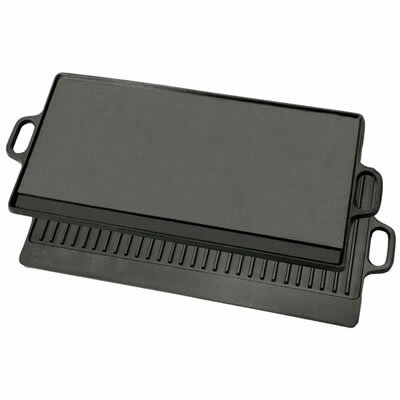 Bayou Classic Cast Iron Large Reversible Griddle offers two different grilling surfaces. 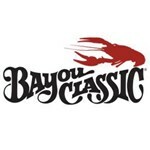 What makes the Bayou Classic Cast Iron Large Reversible Griddle different from all of Bayou Classic’s other griddles is its size and indention for food drippings. One side of this cast iron griddle is ribbed for chicken and steaks. The other side of this cast iron griddle is flat, perfect for pancakes, French toast or toasted cheese sandwiches. The edges of this cast iron griddle are slightly raised for catching food drippings. The square version of Bayou Classic’s cast iron griddles fits perfectly on a double propane burner or over two stove burners. The Bayou Classic Cast Iron Large Reversible Griddle measures 14 inches by 28 inches.